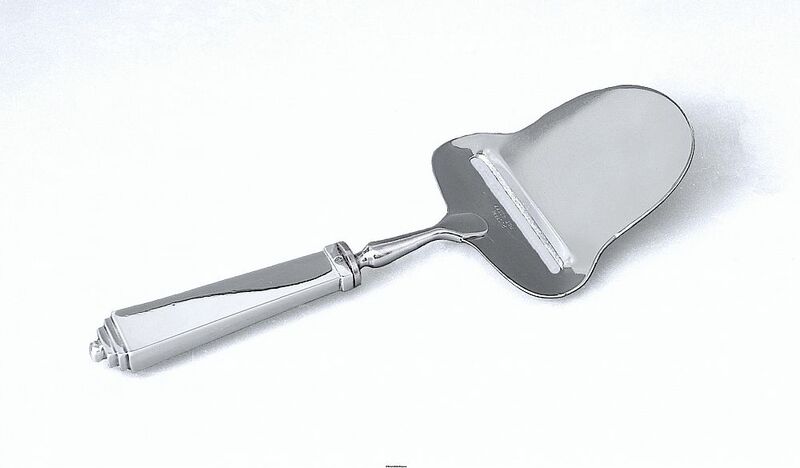 The silver handle of this Georg Jensen cheese slicer/planer is in Pyramid pattern which was designed by Harald Nielsen in 1926. The front of the handle is stamped with the Georg Jensen mark for 1915-1930 namely an upright oval of dots surrounding "GI 925 S" and the back of the handle has the "Three Towers" Copenhagen Assay mark impressed in an oval cartouche and the letters "SJ" impressed in an oval cartouche. The slicer is in stainless steel that is stamped "Rustfri Pat 4377".